Apparently I have a lot on my mind. 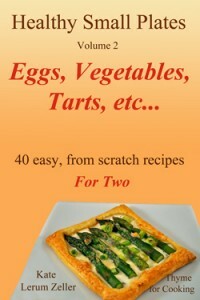 That’s the only reason I can think of (that I’m willing to accept) that I couldn’t remember this recipe. It’s true, I didn’t write any of it down. I mean, why should I? I’ll remember…. It’s also true that I made it three or four weeks ago, but, really, just glancing at the photo should bring it all back, right? Three or four weeks isn’t all that long…..
And wrote it all down. We both liked it so much that I would have done it anyway. Add mushrooms, shallots, chili powder, paprika and sauté 5 minutes. Add vinegar, stock, tomato paste, soy sauce to mushrooms, stir to combine and scrape up any browned bits. Return chicken to pan, turn heat to low and simmer 5 – 10 minutes, until chicken is cooked through, basting a few times with the pan sauce. When we lived in Minnesota we had a beautiful fall garden filled with all colors of chrysanthemums. They often were still in bloom at Thanksgiving making lovely bouquets for the table.. When we moved to France I started seeing them everywhere in early fall and thought how pretty they would be in our garden. Then I learned that one does not plant chrysanthemums in France. Nor does one give them as gifts or have them as bouquets in the house. Chrysanthemums are for the dead. In the US, Memorial Day is when flowers are put on graves and the dead are remembered. 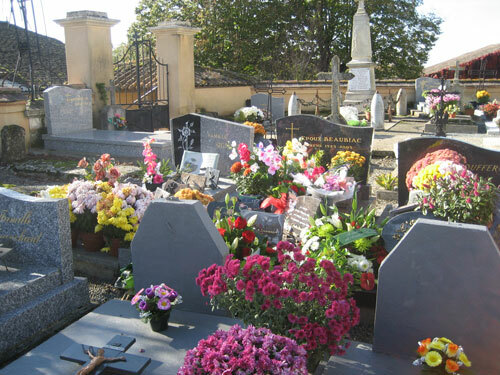 Here, in France that’s done on Toussaint, aka: All Saint’s Day, November 1st. And the flowers are chrysanthemums. In the days leading up to Toussaint there are huge displays of all shapes, sizes and colors for sale everywhere. 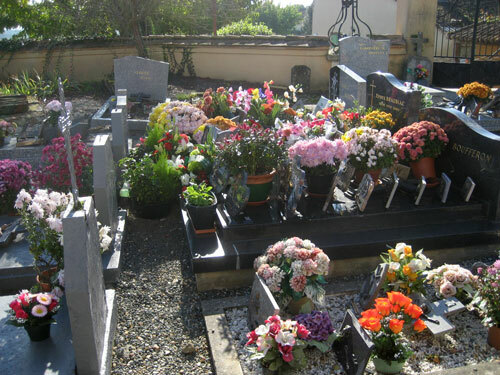 Toussaint is a holiday (in most of Europe, actually) and there are services held at the cemeteries. These are photos of the little cemetery near us that I took this weekend. 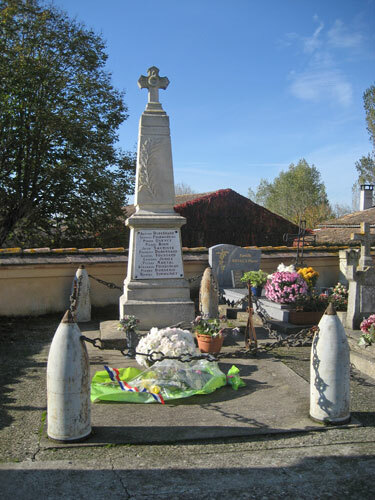 The monument in the photo above with no flowers is not ‘in use’ yet….. The sites are for families and the people who are interred there have small plaques on top of the main monument. There is, of course, a War Memorial as well. Every village, small town and large city has a War Memorial listing the names of those from the area who died in the Great War (WW I), the World War (WW II) and any other conflicts. There is a service held at the War Memorials every November 11th. Memories are long and the dear well-honored here. 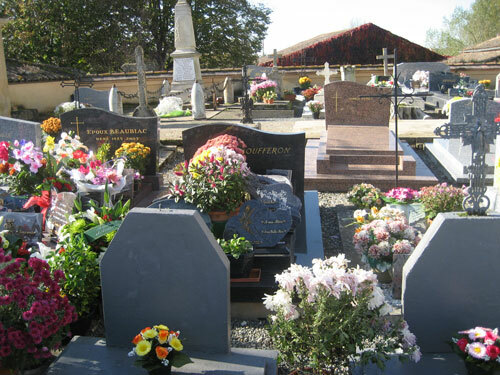 And the cemeteries are beautiful…. I had to laugh when I read this because I recently forgot a recipe. I went to my computer, downloaded the photos and got distracted. Then I raced around the house looking for the recipe I’d written all over. Nope, someone had tossed it – probably because it was covered in slobs. I was so disappointed because the photos were wonderful. 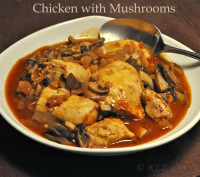 Your chicken and mushrooms look so appetizing! Here, we have adopted the Mexican tradition of the Day of the Dead, held around Hallowe’en time. People build little home altars to the departed and celebrate their lives, as well as mourn their deaths. Oddly, it’s a rather fun time of year. Zoomie, It’s probably based on the same Catholic traditions as here – with an ‘across the pond’ twist. I agree, oddly fun.